For years, people have been saying "advertising is dead." 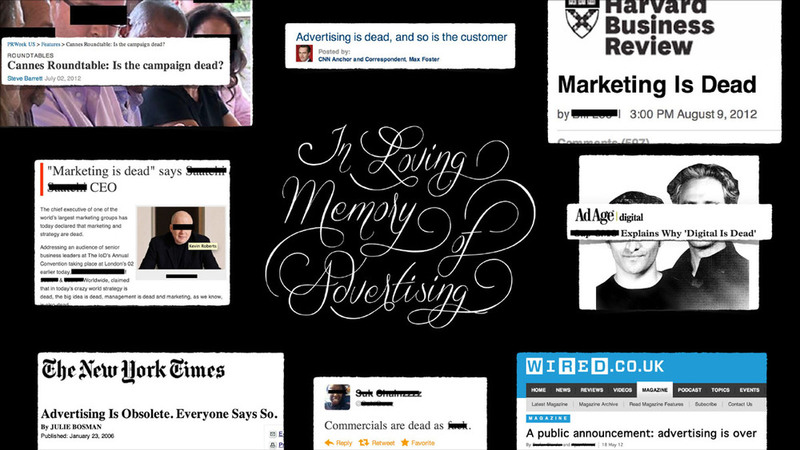 In 2012, JWT NY finally decided to bury it with The Advertising Funeral—a mock memorial for a beloved industry. Featuring eulogies from Matt MacDonald, Gerry Graf, Ryan Kutscher, Cindy Gallop, Charlotte Beers and special performances by the Madison Avenue Gospel Choir. In 2012, Anaka—the extraordinarily patient head of PR at JWT NY—came to Ryan and me and asked if we had any ideas for our panel at Advertising Week. Actually, she had been chasing us on that subject for over a month and we kept blowing her off. This time, she wasn't leaving without an answer. That's when Ryan joked that maybe we should host a funeral for advertising since everyone thinks its dead. I laughed and suggested getting a gospel choir to sing the Meow Mix jingle like a funeral march. And before we could think twice about what we were doing, Anaka was off confirming the topic to the conference organizers. It kind of got out of hand from there. AdWeek ran a story about it—remarking "it will either be brilliant. Or a brilliant mistake." Some of our JWT colleagues around the world called us up to ask if we had lost our minds. We had to explain to Finance why we needed money for a casket. Thank god for our guest Eulogists, Gerry Graf, Cindy Gallop and Charlotte Beers, who joined us at no small risk to their professional reputations to eulogize the industry we all loved. Gerry's speech about the death of TV commercials brought the house down. In hindsight, perhaps it was a mistake to end with the sudden resurrection of Ogilvy, Bernbach and Leo Burnett. That just confused people. Even the gospel choir just stared at us, wondering what the hell was going on. But then they started singing and clapping. The audience clapped too and it was all okay. At the very least, it was only 10% more confusing than a panel about programmatic.